Thank you for being You!-Thanks for being such supportive & fun friends. Your kind comments make me so happy that I get all happy-weepy. You are fabulous! 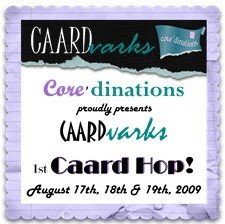 Did you know this is the first Caardvarks blog hop ever?!? We are SO excited! I've been working on making a new template & a new free digital image to share with you on each day of the 3-day hop. Can't wait! 2} It gives a fine score line for really sharp folds. 3} It works great with the Tim Holtz design ruler & with the template placed on top of a piece of fun foam. Hope your day is an amazing one! Thanks for sharing the tool box. I just have one question, what type of needles did you use to make the tools? Ok two questions, How did you anchor the needles into the clay? Again, great ideas, thanks for sharing. My favorite section of all your blog entries is the Cheap Tricks. I LOVE all the creative ways you find to accomplish what others do with an expensive crafting tool. I love your extreme creativity in all the projects you make. Thank you so much for sharing them. I like that Thank you medallion. Sounds like a cool idea that you can put what you want inside of it. I love your little touch of purple stitching. what a cool tool holder and how GENIUS of you to make your own handles for them! I ADORE the idea of the bottle needle! TFS!